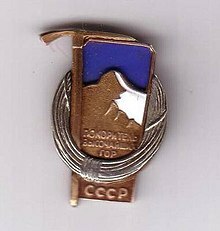 The Snow Leopard award (Russian: Снежный барс) was a Soviet mountaineering award, given to very experienced climbers. It is still recognised in the Commonwealth of Independent States. To receive this award, a climber must summit all five peaks of 7000m and above located in the former Soviet Union. In Tajikistan's Pamir Mountains there are three Snow Leopard peaks, Ismail Samani Peak (formerly Communism Peak) 7,495 metres (24,590 ft), Peak Korzhenevskaya 7,105 metres (23,310 ft), and Ibn Sina Peak (formerly Lenin Peak) 7,134 metres (23,406 ft) on the Kyrgyzstan-Tajikistan border. In the Tian Shan there are two Snow Leopard peaks, Jengish Chokusu (formerly Peak Pobeda) 7,439 metres (24,406 ft) in Kyrgyzstan (divided by the border with China), and Khan Tengri 7,010 metres (23,000 ft) on the Kyrgyzstan-Kazakhstan border. Khan Tengri's geologic elevation is 6,995 metres (22,949 ft) but its glacial cap rises to 7,010 metres (23,000 ft). For this reason, it is considered a 7000m peak. 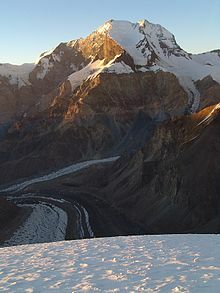 In order of difficulty, Peak Pobeda is by far the most difficult and dangerous, followed by Khan Tengri, Ismail Samani Peak, Peak Korzhenevskaya, and Lenin (Ibn Sina) Peak. ^ "Альпинисты Северной столицы. История появления жетона «Покоритель высочайших гор СССР» («Снежный барс»)". www.alpklubspb.ru. ^ "Wejherowo - Wikipedia, wolna encyklopedia". www.russianclimb.com. This page was last edited on 11 April 2019, at 19:33 (UTC).